As Rock Island grew and expanded up the bluff, small retail centers developed concurrently to serve the new residents. Our Real Photo postcard showing 14th Avenue near 38th Street is from the Special Collections at the Augustana College Library. It was mailed – and probably created — by downtown photo shop owner Don Wright. There may be many more Rock Island views on postcards by Mr. Wright. If you find one in your collection, please let us know. 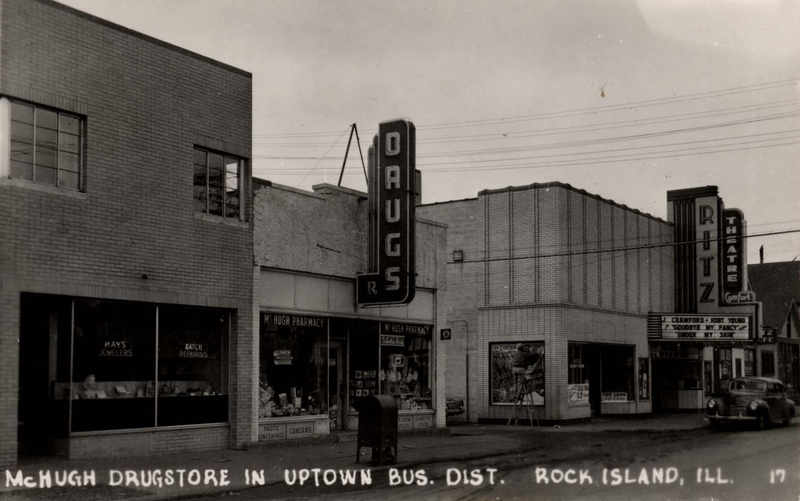 Although the postcard, captioned “McHugh Drugstore in Uptown Business District, Rock Island,” was mailed in 1958, the scene can be dated to several years earlier. At the far left is Hays Jewelers (and Watch Repairing) at 3824 14th Avenue, center is McHugh’s at 3822, and at right is the Ritz Theatre, 3820 14th Avenue. These three buildings still stand today, little changed but housing different businesses. The nearby uptown residential neighborhood grew almost overnight in 1918 when over 200 new homes were built. The commercial use expanded, too, from paperhangers to plumbers to the most important — grocery stores. For many years one was located midblock and another on the corner. Before every family had a car and reliable refrigeration, grocery shopping, done on foot, was an everyday occurrence. Today we can identify many of these former neighborhood grocery store buildings in otherwise residential areas throughout the city. They are usually two-stories with a rectangular “false front” parapet concealing a gabled roof. Invariably they are built adjacent to the sidewalk with no front yard setback. The Ritz was a Brotman family theatre. Patriarch Michael Brotman got his entire family involved in the movie business in 1915 when he took over the Dreamland theatre at 621 9th Street. In 1921, he built the nearby Rialto theatre in the same block. The Rialto seated 600 and lasted till the 1960s urban renewal days. The three Brotman sons, Isadore, “Buster,” and Barney, provided violin, drum, and piano music for silent movies while their entrepreneur mother introduced movie popcorn sales to the Quad Cities. At one time, the Brotman family owned six theatres in Moline and two in Rock Island, the Ritz, managed by Isadore, and the Rialto, managed by Barney. The end of the year edition of the Argus for 1941featured the “New” Ritz theatre, which replaced an earlier one at 38th Street & 14th Avenue. The theatre was designed by architect Ben Horn and looks much as it does today. It continued as a theatre, complete with a dairy bar, until 1952, when it was converted to offices and apartments. First called the Ritz Apartments, it became the Elston Apartments in the 1970s, named for Glenn Elston who had maintained a real estate and insurance office there for many years. The theatre’s detailing is an excellent example of the Art Moderne architectural style in Rock Island. Characteristics include buff-colored brick, a flat-roofed rectilinear shape with decorative vertical “stripes” of brick on the second floor adding visual interest. Today the sign and marquee are missing and windows have been inserted into the second floor façade. McHugh’s building, also sporting a streamlined neon sign, is older. Its 1930s appearance on the postcard was the result of either a major remodeling or complete replacement of an earlier grocery store building at the same location. The drugstore use dates from the mid 1940s, when Maxwell McHugh opened for business. A few decades later it was sold to Donald Humes who had previously worked for Mr. McHugh and who continued operation under the McHugh name. At that time, plans were made to “modernize” the interior of the building, but the Humes’ son, who appreciated its unique architectural qualities, discouraged them. As a result, the building survived intact. But changes were made, thanks to Mrs. Humes. She introduced a selection of unique and high quality gifts that made the store a destination for shoppers from throughout the Quad Cities. Sometime after the photo was taken, the neon sign was removed and the façade was covered with brick that continues the appearance of the two-story Hays building next door. At the same time, the step on the roof parapet was removed. The Hays Jewelry building dates from the late 1940s, replacing an earlier residence at that location. The corner steel-framed windows, the smooth sleek brickwork and the overall geometric simplicity of its shape carry the Art Moderne style of the 1930s into the post-war International style. International style buildings are rare in Rock Island. These buildings are all over fifty years old, hence eligible for historic status. Despite some changes and new uses, the streetscape is easily recognizable. With a couple of antique cars along the curb and some early movie posters in the windows, the 1950s would be evoked. And that’s what historic preservation is all about – preserving a sense of time and place. This article by Diane Oestreich is slightly modified from the original, which appeared in the Rock Island Argus and Moline Dispatch on April 4, 2004.